Whether they’re opening a newsletter or visiting a shopping cart page, how users interact with web content is very interesting to publishers. One way to understand user behavior is by using pixels, small 1×1 transparent images embedded into the web property. When loaded, the pixel calls a web server that records the request parameters passed in the URL that can be processed later. User visits are spiky, so pixel servers must scale up to sustain the load and scale down to limit the spend. Google Cloud Platform (GCP) services such as Container Engine and managed autoscaled instance groups can help with those challenges. But at Google Cloud, we think companies should avoid managing infrastructure whenever possible. A client calls a pixel URL that’s served directly by Cloud Storage. 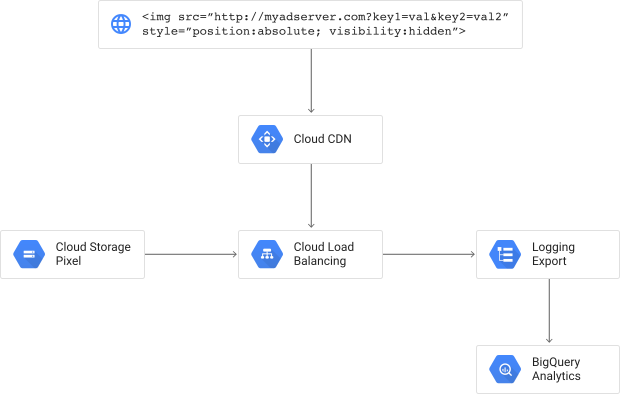 A Google Cloud Load Balancer in front of Cloud Storage records the request to Stackdriver Logging, whether there was a cache hit or not. Stackdriver Logging exports every request to BigQuery as they come in, which acts as a storage and querying engine for ad-hoc analytics that can help business analysts better understand their users. Going forward, we look forward to building more serverless solutions on top of GCP managed offerings. Let us know in the comments if there’s a solution that you’d like us to build!